I have slowly been getting into Moroccan cuisine and I have really been enjoying it. In particular I have really been liking the spice blends and flavour combinations in Moroccan tagines. A tagine is a dish that is made in a tagine clay cooking pot that is particularly good at braising. Despite the fact that I do not have an authentic tagine I have been enjoying all of the flavours that slowly braising the ingredients brings out. A while ago I came across a recipe for an artichoke and fava bean tagine on Elra’s Cooking that sounded good. I have really been into artichokes lately and I had been wanting to do more with fava beans so it did not take much to get me to add this to my meal plan. The only problem was that the locally grown fava beans had yet to make an appearance so I patiently waited for them. This weekend I found the fava beans and immediatly picked some up. I had really liked the chicken tagine with olives and preserved lemons that I had made a while ago so I decided to start with that recipe and treat it more like a vegetarian tagine with the artichoke hearts and the fava beans forming the base. Next up was the flavours of the olives, raisins and preserved lemons followed by a nice Moroccan spice blend and some harissa and honey for a bit of heat and some sweetness. I served the artichoke and fava bean tagine on some whole wheat couscous and I garnished it with some chopped parsley, mint and almonds. The artichoke and fava bean tagine turned out really well! What an amazing blend of flavours and textures! The tagine was just packed with flavour and the artichoke hearts and fava beans worked really well in it. I am glad to have found another recipe to enjoy fava beans and this recipe will definitely be on my list of things to make with fava beans in the years to come. I am now looking forward to exploring even Moroccan cuisine. Add the garlic and ginger and saute until fragrant, about 1 minute. Add the artichoke hearts, fava beans, olives, preserved lemon, raisins, cumin, cinnamon, turmeric, harissa, honey and vegetable broth and bring to a boil. Reduce the heat, cover and simmer until the vegetables are tender, about 10-20 minutes. Remove from heat and stir in the parley and mint and garnish with chopped almonds. Option: For One-Pan: Make this a one-pan meal by adding 1 cup couscous and 1 1/2 cups broth or water after step 5 and bring to a boil before removing from heat and letting sit, covered, until the couscous is tender, about 10 minutes. You've gone and done it again – picked 2 of my favorite ingredients and put them in a tagine – one of my favorite ways of cooking. Pass a tissue, please….I'm drooling! Love Moroccan spices, but sadly I still have to use the oven and a cast iron pot…..I am still looking for a tagine!!! Love the ingredients that you have used!! love the Moroccan flavorings and the choice of ingredients. great looking dish kevin! I had never tried any dish using Artichokes. And very curious about how it tastes. But this looks good. Will try this sometime soon.. I make quite a lot of tajines in my sturdy le creuset tajine. I have not made a vegetarian one yet but I will soon. Fava beans are not commonly used really but they are a staple in the middle east therefore a great ingredient for a tajine. The lemon with the artichokes, raisins and all those spices – MMMM. what a lovely looking recipe! artichoke, fava beans, harissa, cumin & all things wonderful. I cannot have enough of moroccan flavorings. The color draws me right in…I can imagine what this smells like just by the photograph alone. That looks amazing! I had a tagine once at a restaurant and thought it was soooo good. I always wondered how to make it! Looks amazing! I love those Moroccan spices! This looks delicious I haven't really gotten into Moroccan food at all yet. Did you use canned artichoke hearts? One thing I love about your site Kevin is you make things I never would have thought of and use ingredients I've never tried! I used to be a super picky eater and over the last year have totally tranformed what I eat. Meaning I love way more vegetables than I ever did and loving it! Fava beans is one of those things I've never tried. I'm book marking this for sure. I absolutely love tagines and am always looking for a good veg one. This looks terrific! 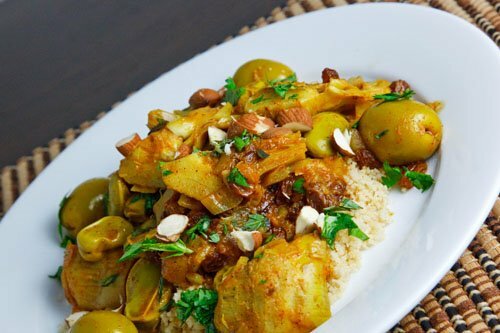 This Moroccan dish looks delicious! Love the spices in it. Nice picture as well. I like the color of this dish.It looks very tasty based on the color of the sauce alone..
What an interesting dish. I've only had Moroccan food once and thought it was tasty. Hi! I have been reading your blog for awhile now, and this is the first thing I made. It turned out really great; I am happy with it because it's vegetarian. I had a hard time finding harissa so I just didn't put that in. Do you know of any grocery stores that sell it? Jamie: I found the harissa at a small specialty import shop. I was thinking about trying to make some myself as well. i have same this topic..
Added Shrimp, came out great.